Eurocom is adding the NVIDIA GeForce GTX 780M in SLI to the custom built EUROCOM Panther 5D and Scorpius 2.0 3D high performance 3D capable Laptop computers. The NVIDIA GeForce GTX 780M graphics card has 1536 CUDA cores running at 823 MHz with 4 GB GDDR5 memory running at 1250MHz. 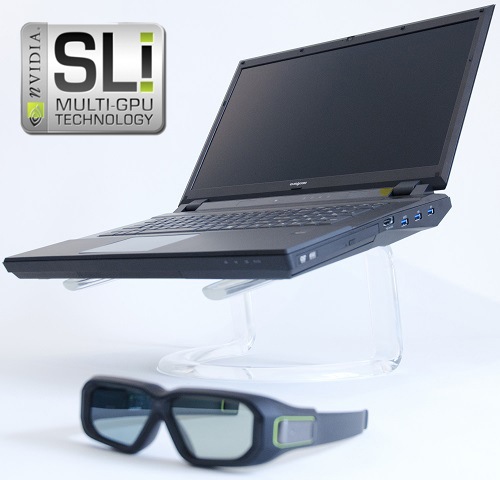 In SLI the two 780M graphics cards offer EUROCOM Panther and Scorpius users up to 8 GB DDR5 video memory, 3072 CUDA cores, 256 TMUs and 64 ROPs. “The EUROCOM Panther 5D and Scorpius 2.0 will both support two NVIDIA GeForce GTX 780M cards to give our customers the most graphically capable Laptops in the World, offering 8 GB DDR5 memory and 3072 CUDA cores for CUDA developers who are on the go” Mark Bialic, Eurocom President. The addition of the NVIDIA GeForce GTX 780M, the highest performance mobile solution from NVIDIA, gives Eurocom customers a superior choice of graphics processor to configure into their new Panther or Scorpius, which already consists of AMD Radeon, NVIDIA GeForce and NVIDIA Quadro graphics to give Eurocom customers the exact graphics configuration to fit their specific application. Enjoying the latest content is all about visuals. The Panther and Scorpius line of high performance 3D laptops from Eurocom support beautiful full high definition 1080p 1920x1080 matte and glossy displays with the option to go with a fast refresh 120 hz panel for 3D operation on the go. The Panther is based on Sandy Bridge-E X79 Express chipset and supports a complete line of Intel LGA2011 desktop processors, consisting of Intel Core i7, Intel Core i7 Extreme and Xeon processors. Using quad channel memory, Scorpius and Panther are able to support 32 GB DDR3-1600 memory. Support for four storage drives allows the Panther to have up to 4 TB of RAID 0/1/5/10 storage via Solid State, Hybrid or Hard Disk drives. A wide range of connectivity and expansion technologies are supported, such as USB 3.0, Firewire 800, Expresscard 34/54, eSATA, HDMI 1.4a, Display Port 1.2, DVI-I and a 9 in 1 media card reader, in addition to several others. The expandability of the Panther allows it to accommodate additions to its capacity and capability.